Stirling Moss was back to his imperious best at the legendary Nürburgring, where he beat the more powerful Ferraris through sheer driving brilliance. He led from start to finish on the twisting, plunging 14.2 mile circuit through the forests of the Eifel mountains. This race was significant because it saw the first appearance of the new V8 Coventry Climax engine which was available to both Cooper and Lotus. Previously, the two marques had been relying on an older four cylinder design, but now they had an engine to take on the V6 Ferraris. 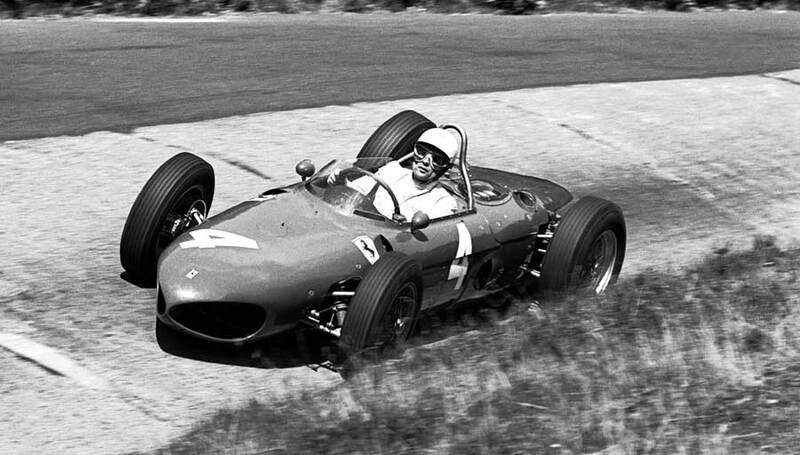 That was proven in practice when Jack Brabham put the V8 Cooper on the front row next to Phil Hill's Ferrari on pole. Before the start it rained heavily, although the weather cleared as the cars took to the grid, causing much consternation about tyre choice. Brabham opted for dry tyres, but, although he took an early lead, he skidded on a wet patch of road and crashed through a hedge half way through the first lap. Moss, who had gambled on the rain returning during the race, set off on wet weather tyres and took the lead when Brabham crashed. The Ferraris of Wolfgang von Trips and Hill, also on dry tyres, were on his tail and chased him throughout, but never quite managed to out-manoeuvre the Lotus. Behind them there was drama when Innes Ireland's Lotus burst into flames as he was travelling at 100mph. Braking hard, he eventually came to a halt, with the right arm of his overall on fire as he scrambled from the car. He was uninjured, but the car was completely burnt out. The track dried quicker than expected, playing into the hands of the Ferraris, and von Trips established a new lap record as he swept past team-mate Hill into second place on the eighth lap. Moss, however, was driving supremely, and kept von Trips at bay until it started to rain heavily again with just three laps to go. This gave Moss the advantage and he pulled away to win by more than 20 seconds, in what turned out to be his last grand prix win, and without doubt one of his greatest. Von Trips and Phil Hill fought a terrific battle for second place, finishing just 1.1 seconds apart, with the German coming out on top. This gave him six world championship points, increasing his lead over Hill to four points, with Moss in third, a further eight points behind. Tragically, this was von Trips' last home grand prix, as he was fatally injured a month later in Monza.